Production for the troubled live action Akira movie could now be on the fast track. A movie based on the 2100+ page Katsuhiro Otomo manga epic Akira has been on the Hollywood rollercoaster for a while now, sometimes seemingly making progress into existence and at other times disappearing completely. According to producer Andrew Lazar, it's definitely still in the works and a priority. Speaking to Collider, Lazar said that Akira is "still moving forward." A new writer has been hired and the team is conceptualizing it, with "lots of pre-production" going on right now. These are decent signs by themselves, but Lazar also said that Warner Bros. Pictures loves the property and that it is "very enthusiastic." There was no mention of a possibly gigantic budget as has been rumored in the past. 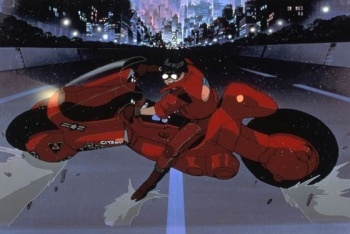 Akira was made into an animated film in 1988 which became very popular worldwide. It tells the dark and brutal story of a futuristic motorcycle gang that gets involved with a secret psychic government experiment. At one point in time, anybody that liked anime had without a doubt seen Akira. Warner is actually planning to create two films, splitting the six voulmes of Otomo's manga between each. The anime and manga are definitely both worth experiencing, though two live action films with a big budget could be even better if done correctly.